Two $750 awards named for charter member Veronica Connor will be presented to two high school seniors. To be eligible, the senior high school candidate must reside on Grand Island and be accepted at a college. For those seniors attending Grand Island High School, applications are available through the guidance department (due April 26). For those attending other area high schools, applications are available online through Isledegrande.com or by calling 716-479-2599 and leaving a message. Memorial Scholarship Award – One $750 scholarship will be presented to a woman between the ages of 18-25. This award is in memory of deceased Zontians who gave of their time and resources to improve the status of women. To be eligible for this award the applicant must be at least 18 years old (not a high school senior) and be enrolled in a degree or certification program. Applications are available online through Isledegrande.com or by calling 716-479-2599 and leaving a message (due May 15). Zonta Club of Grand Island scholarships were awarded June 28, 2016 at the Buffalo Launch Club to four Grand Island women. 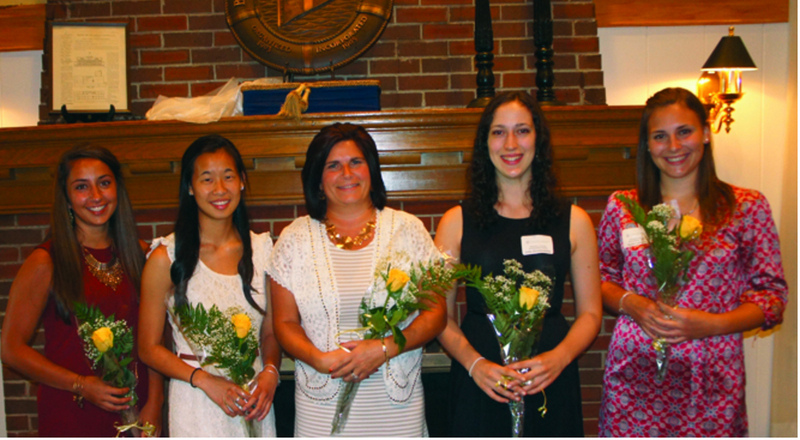 In the photo above are our scholarship winners, from left, Julia Lawley, Margaret M.H. Rustowicz and Yaling Chen (not shown, Megan Karpie); and guest speaker Bethany Bernatovicz, owner of ASI Signage and a former Zonta Scholarship winner. Congratulations! 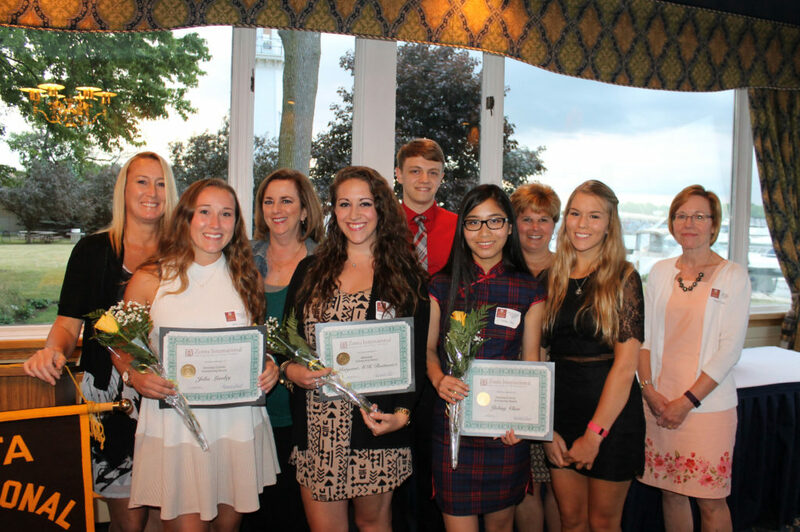 Four young Grand Island women received a boost to their college education when the Zonta Club of Grand Island held its 2016 Scholarship Award night June 28 at the Buffalo Launch Club. 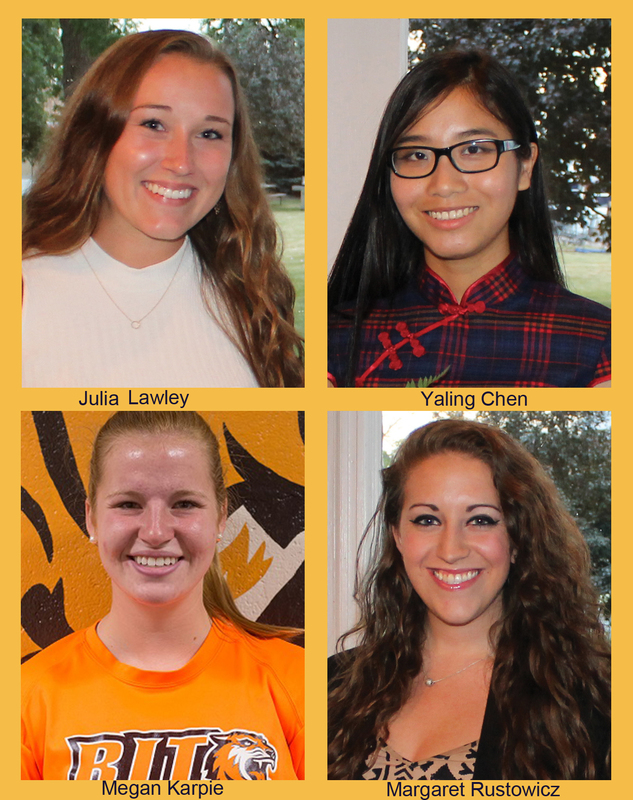 Grand Island High School graduating seniors Julia Lawley and Yaling Chen are winners of Veronica Connor Scholarships. The scholarships are presented to high school seniors who live on Grand Island. Megan Karpie and Margaret M.H. Rustowicz are winners of the Zonta Memorial Scholarship, in honor of Zonta members who have passed away. The award is presented to young women 18-25 who are already enrolled in a degree program. Each of the four scholarships is in the amount of $750. Guest speaker was Bethany Bernatovicz, owner of ASI Signage and a former Zonta Scholarship winner. • Yaling Chen plans to attend Canisius College in the fall to major in accounting with the goal of becoming a CPA. Chen has written of the gender inequality she experienced in her native country of China. She has said when you invest in women and girls, you invest in stronger, more stable families and communities for future generations. The Veronica Connor Scholarships are in memory of the late educator and charter Grand Island Zonta member for whom Grand Island middle school is named. • Megan Karpie is a 2012 graduate of GIHS. She attends the Rochester Institute of Technology in the five-year BS/MS Physician Assistant program. She is an active member of the RIT honors program, is a member of the women’s track and field team and has received RIT’s Outstanding Undergraduate Award. Her career goal is to work as a physician assistant in internal or emergency medicine. Due to her clinical rotation schedule in Rochester she was unable to attend the event. • Margaret Rustowicz is a 2015 GIHS graduate who attends St. John Fisher College in Rochester. She has completed her first year in the bachelor of science nursing program. She would like to enter the workforce as an RN and continue her education to earn a nurse practitioner degree. She works as a volunteer at Strong Memorial Hospital in Rochester, as a peer mentor on campus and does fundraising for Camp Good Days and Special Times. In selecting winners from the applicants, the scholarship committee looks for the qualities Zonta stands for: independence, motivation, commitment and family, community involvement and leadership potential. Guest speaker Bethany Bernatovicz lives and works on the Island. She is vice president and player development director of the Grand Island Soccer Club. In high school, she received the Tom Hewitt Scholar/Athlete Award and Western New York Golf Scholarship. She loves sports and graduated with 16 varsity letters, including for soccer, volleyball, basketball and track. Find out more about Zonta by visiting our Facebook page at facebook.com/zontaclubofgrandisland. Scholarship winners and their guests at the Zonta Scholarship dinner June 28, 2016. From left, are Dawn Lawley, scholarship winner Julia Lawley, Maura Rustowicz, scholarship winner Margaret Rustowicz, Owen Morrish, scholarship winner Yaling Chen, Mary Jane Fonte, Haley Melisz and Kathy Karpie, mother of scholarship winner Megan Karpie (not shown). Bethany Bernatovicz, left, congratulates Zonta Scholarship winner Julia Lawley, right, who attended the Zonta Awards Dinner with her mother, Dawn Lawley, Center. Bernatovicz, owner of ASI Signage, was guest speaker at the event. 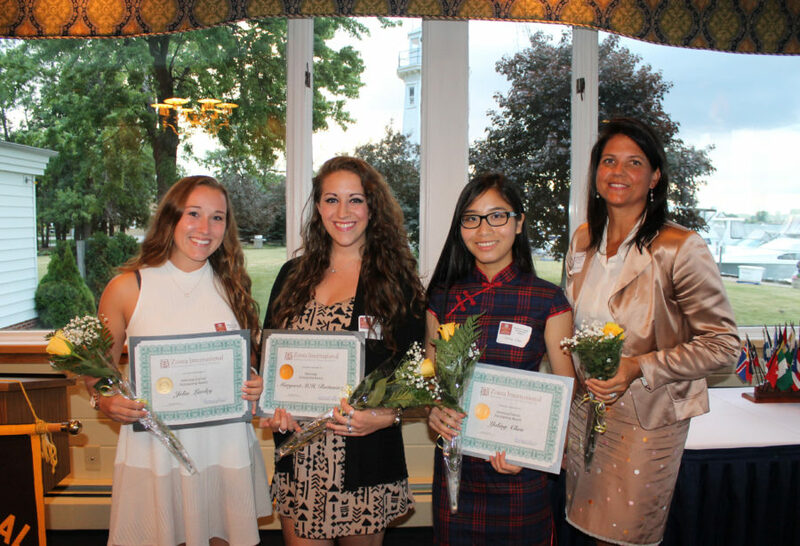 The Zonta Club of Grand Island awarded four scholarships and heard a keynote speech from a former scholarship recipient at an awards dinner held June 23, 2015, at the Buffalo Launch Club. Guests of honor included: Angelina Howe and Annaliese Corrao, winners of the club’s Memorial Scholarship for current college students; the club’s guest speaker at the Scholarship Awards Dinner, Janice Hobba-Glose, R.N., an assistant professor of nursing at Daemen College; and Julia Drozdowsky and Taylor Latvala, winners of Veronica Connor Scholarships, awarded to graduating high school seniors from Grand Island.